Last week I asked: Where is Cutler Botanic Garden? 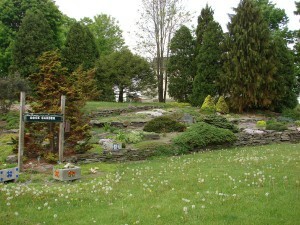 For years, John and I have been driving Route 81 and finally stopped in Binghamton and visited the Cutler Botanic Garden. 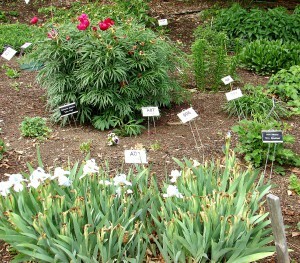 The garden is one of about 360 gardens in the United States designated as a display garden for All-American Selections. Each year, the staff previews the AAS winners that will be available commercially the following year. What started as a vegetable garden in the 1970s grew to become the cornerstone of Broome County’s Master Gardner program. Today, the garden paths twist around gardens of perennials, wild flowers, herbs and more. There is a pretty rock garden, a heritage vegetable garden, and the Rose Walk is lined with Antique roses. The garden has a truly unique trail: The Shakespeare Trail. Cornell Cooperative Extension and the Shakespeare Dramatic Club of Binghamton have created a trail that identifies plants that are cited in the Bard’s works along with the quotation. We stopped a little too early in the season so most of the gardens were not at their peak. Another unique place we visited in the area was the Candyland, which is actually in Port Crane not far for the city of Binghamton and part of the Windy Hill Candy Factory. They make their own candles including long tapers and floating votive candles. There are candles with every scent imaginable including ones that emit the luscious smell of apple pie and cinnamon buns. My favorite candle was the one that had money hidden in it. They are created in batches of 500. While all contain money, only one in each batch will have a $100, $50, $20, $10 or $5. Forty-five will have a $2 bill and the rest $1. Of course, we bought one. Have a favorite candy from your childhood that you thought was no longer available? 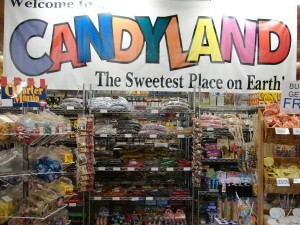 If it is still in production, you may find it at Candyland where there are stacks of hard-to-find “retro” candies. In Binghamton, Clinton Street has been designated as Antique Row. The Old, Odd, and Unique is true to its name. At first, the owner, Laddie Vanna, was only going to sell “guy gadgets” such as old cameras, tools, and hunting items. We stopped at The Mad Hatter Antiques. Sadly, my buying days are over because we need to downsize not accumulate more. However, I still love to browse in antique stores. 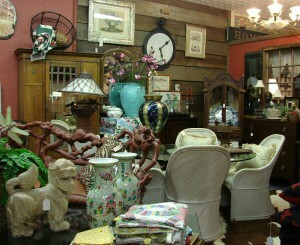 The three floors are full of antiques, one-of-a-kind furnishings and collectables. One of the great things about antique stores is that the owners always have time to chat. We enjoyed chatting with Joanna Scott who had often visited our area. 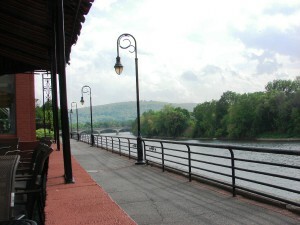 Binghamton was one of our NYS getaway destinations for this summer. We checked into the Holiday Inn which is located in the heart of downtown near the conjunction of the Chenango and Susquehanna rivers. It turned out to be a great choice. We walked up to the Galaxy Brewery where Michael Weisel and his son, Seth, explained their beer making. We returned to the hotel for dinner on the patio on the river front and enjoyed chatting with some of the walkers along the riverwalk. Trivia Tease™: Where is the Carousel Capital of the World?